This headdress is typical of the Brianza region of Lombardy. Women in other parts of Lombardy and Piedmont, Ticino in Switzerland, and as far away as the Adriatic coast of Croatia, wore similar headdresses and pins. The Italian word ‘raggiera’ means rays, and is used for all headdresses of this type. In the Brianza this headdress is also known as a ‘sperada’. Alessandro Manzoni famously described it in his book 'I promessi sposi' in 1827. The first time a young woman wore it was on her wedding day. Her mother-in-law, or other female relative, dressed her hair in a complex arrangement of braids, ribbons and partings which formed a horseshoe shape at the back of the head. 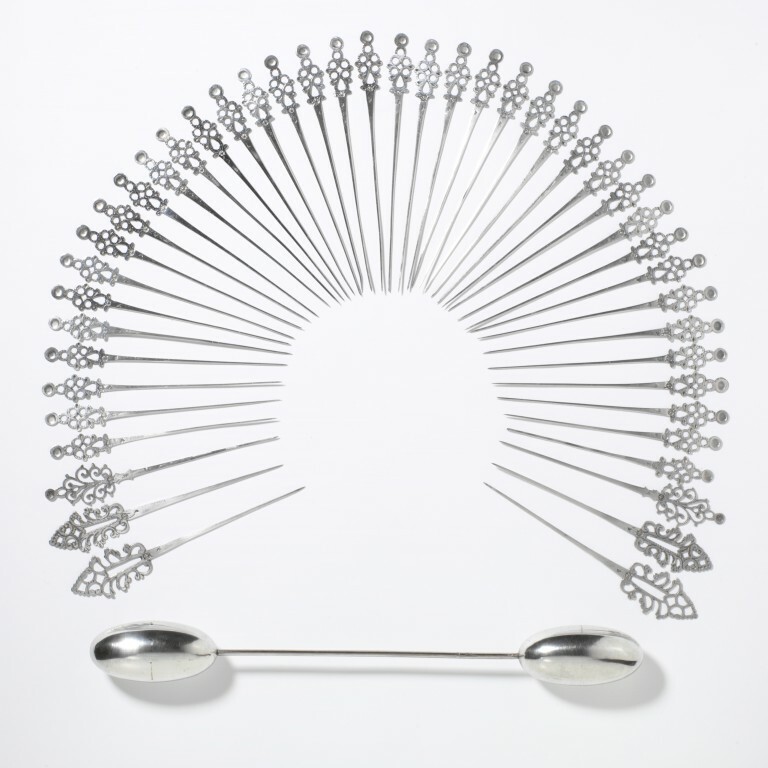 The 45 flat silver hair pins with pierced heads were stuck into the outside edge of the horseshoe, so that they surrounded her head like a halo. The long pin, with a hollow egg-shaped head at each end, lay across the nape of the neck, supporting the horseshoe of hair. The ends of the egg-shaped pin unscrew, so that it can be taken out without disturbing the hair. The hairdo was often left in place for several days. The wearer added the pins each morning. 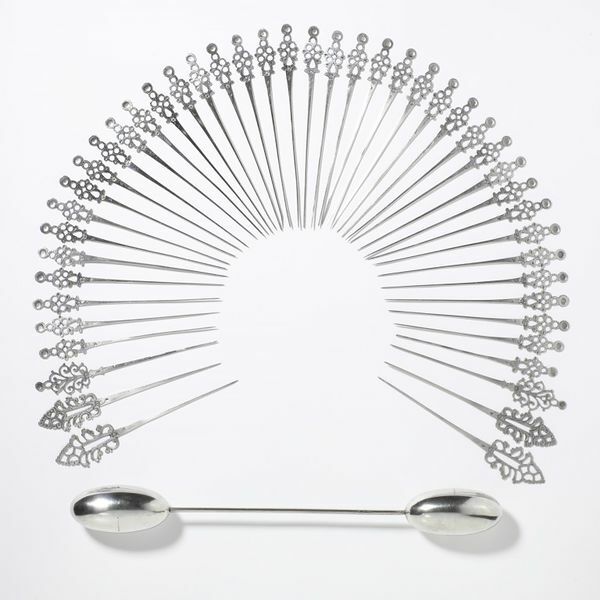 A set of at least 15 pins was a compulsory part of the bride's dowry. Over the years her husband would give her more, as a visible demonstration of affection and wealth. These were bought for £4 8s (the set) as part of the Castellani collection of Italian Peasant Jewellery at the International Exhibition, Paris, 1867. 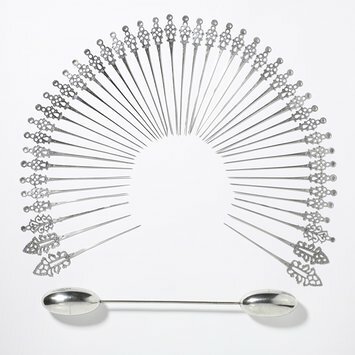 Silver headdress, consisting of 45 pins with flat openwork heads resting on a pair of interlocking pins with large hollow egg-shaped ends. On front of stem, just below the head, on 44 of the raggiera pins. On front of stem, just below the head, on all raggiera pins, and on stem of egg pins. Silver head-dress (raggiera) made from 46 hair pins, Lombardy (Italy), c. 1860.